Some of the best deep water fishing in Maine! 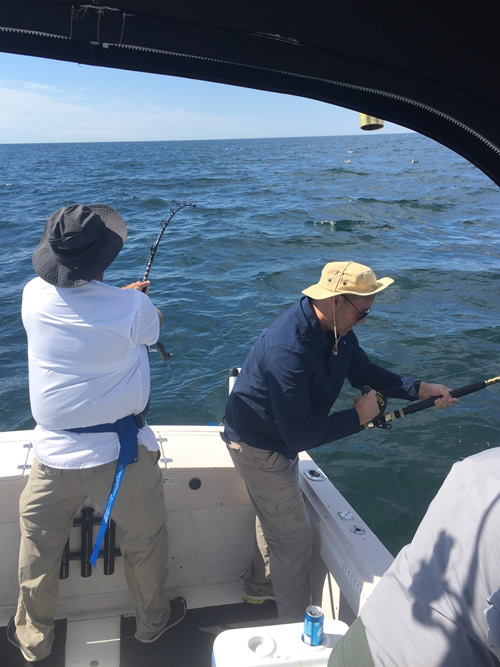 Captain Ben is proud to offer one of the best ground fishing charters in southern Maine. Maine’s ledges hold some of the best ground fishing on the East Coast. Cod, Haddock, Pollock, Monkfish and other bottom fish are all possible catches aboard the Kristin K. Ground fishing will take you further out than our inshore fishing options so a full 8 hour day is recommended. Captain Ben will take you 20-30 miles offshore often to Tantas or Jefferies ledge in depths of 180-300 feet of water. Jigging the bottom with butterfly jigs or bait fishing the bottom are the techniques used depending on the weather conditions. Whale sightings out here are very common! Experienced to advanced anglers are usually recommended for this type of trip but Captain Ben is a wonderful teacher. If you would like to take your fish home with you, Capt. Ben would be more than happy to fillet and bag your fish so it will be ready for the grill or your freezer. Click or tap the other activities here to learn more about them.